How important is originality really? Last week I got surprised by my wife with two, yes 2, books by Michael Kenna for Valentines Day. I can honestly say that that was the BEST Valentines Day ever. Over the past week or so I've been absorbing Michael Kenna through these books. Wonderfully printed, probably like 3 colour process with a spot varnish. Fantastic work both on the photography (duh) as the printing process. 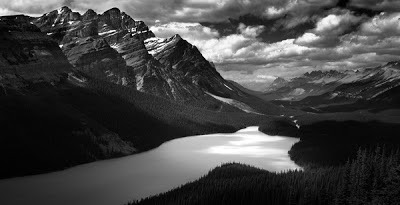 Another photographer I really like is Josef Hoflehner. His style is very closely related to Kenna's. Classic minimalistic photography. And amazingly deep portfolios. Check his work out if you don't know him. But there is one photograph in Hoflehner's portfolios that, let's say, bothered me somehow. I can't help but think, this was deeply inspired by Kenna. There's a few more but this one was, in my opinion, too closely related to Kenna's one. Both originals can be found here for Hoflehner's version and here for Kenna's version of Tsarskoe Selo, Russia. Ok so there's a clear resemblance where the inspiration came from in my opinion. And that brings me to the following questions. How important is 'originality of subject' in todays photography where 'everything has been done before'? Are you ok with photographing the 'classics' from the 'classic vantage points', like Inspiration Point in Yosemite, Zabriskie Point in Death Valley or even the lookout over Peyto Lake, just to name a few, or are you looking for subjects that haven't been photographed before? 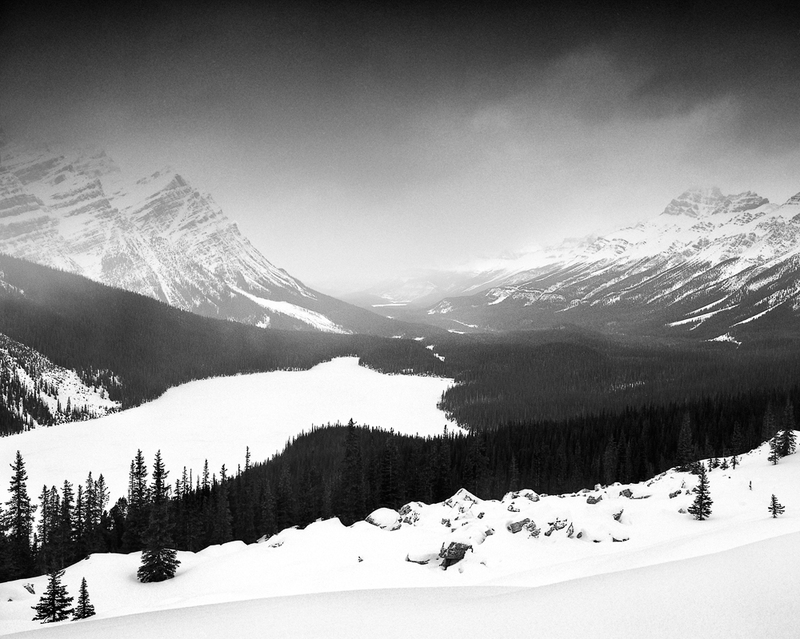 Here are two versions of Peyto Lake photographed by me. Both photographs are made from almost the same spot. The top image is a photograph I made just a few weeks ago, standing on the edge of what is called 'The Boulder Field', the bottom photograph is one I made from the viewing platform (50 meters up from the first one) in July of 2007. Well, we all have seen these photographs a million times before. Just do a Google search and see for yourself. Or click this link if you are lazy. So yes, me too, I am guilty of letting me 'inspire' by someone else's work. I am a firm believer though that subject matter chooses YOU and not the other way around. Let me explain. I am not a very outgoing person for instance. Heck I am an ISTJ (which basically means, I don't like to play with others). There is a reason why my work tends to lean towards minimalism. There's a reason why I seek out lonely trees for example. I would go even further and say I go look for them. I don't know why. Back home, I couldn't care less about nature. But coming to Canada, and calling Canada my home for the last 4 years now has had a profound effect on my personality. I admit, I am a very different person now than I was then. And that proves to me, that not only your personality but also your surroundings, play a huge role in who you are as an artist. Or what exactly photographically speaking 'attracts you' to photograph it. Maybe for me it's the lack of friends here that pushes me to photograph lone things. That's not a cry for self pity or anything, no I love the simpleness of my life here. Not having too many friends (but they are all close friends) cuts back on social priorities a lot. Also I think that photographing in the way you photograph is and should be a reflection of your inner self, not someone else's. But I think that also the subjects we tend to gravitate towards are reflections of our personality or states of mind/mood we are in. Now I also believe in photographing what you love. And those interests are directly related with your personality. So as a result, I think, you will photograph the things you like to see, using a visual style that represents your personality. You see the viscous circle, us photographers are really in? But when it comes to photography I like to get as less influenced by other photographers as possible. I like to work by Cole Thomspon's 'Photographic Celibacy' rule. You can read what Cole means by that on his blog or click this link here. But either way, not getting yourself inspired by others means that you have to shut yourself out of everything that is around you. And as people living in a very visual society that is also a very hard thing to do. We are constantly bombarded by images that it is very hard for us not to get influenced by anything. Even the smallest element can spur inspiration or influences the way you see a scene. It's dangerous but can be rewarding as well. In the end we should aim to be original artists I think. I have copied other photographers work in my early days as well. I think that is a normal step to take. You will understand composition a bit better I think. Or even copy a processing style. Ultimately you will find your own way. But copying can be a valid exercise. But that's where it should stay at, an exercise, nothing more. That's why I was a bit disappointed when I saw an almost straight copy of Kenna's photograph. It proved to me that one photographer was inspired by the other and was influenced by the previous composition. Which leads us back to the question, how much does your personality influences your work? I would love to hear your comments on this and hear your side of things in the comments below.